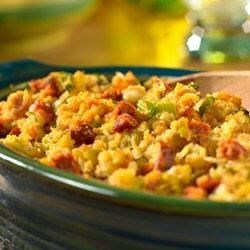 "Who said stuffing has to be typical? This delectable recipe is kicked up with flavorful chorizo sausage and mild green chilies...it's unexpected and really tasty!" Heat the butter in a 4-quart saucepan over medium-high heat. Add the onion and celery and cook until the vegetables are tender-crisp, stirring occasionally. Remove the saucepan from the heat. Add the broth, stuffing, sausage, chiles and cilantro to the saucepan and mix lightly. Spoon the stuffing mixture into a greased 2-quart casserole. Cover the casserole. I thought this was a good recipe, I tried it as is and it was good. I tried it a second time and added garlic and green onions and really liked it.